SDG 13 – Climate Action, by reducing CO2 emissions and stabilising the level of atmospheric carbon through substitution of non-renewable and fossil materials, and by storing carbon in wood products. 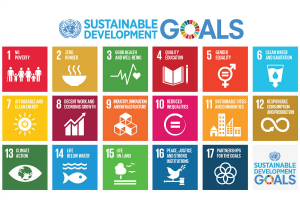 SDG 12 – Responsible Consumption and Production, by incorporating socially, economically and environmentally responsible practices in all stages of the production chain, and by supporting a viable, low-energy Circular Economy. SDG 15 – Life on Land, by recognising the contribution of Sustainable Forest Management in all of its important ecological, social, cultural and economic dimensions, including the sourcing of wood raw materials. SDG 8 – Decent Work & Economic Growth, through the invigoration of rural economies and communities in forested areas. SDG 9 – Industry, Innovation and Infrastructure, through continuous innovation in processing techniques and products. SDG 3 – Good Health and Well-Being and SDG 11 – Sustainable Cities and Communities, through the impacts wood buildings and wood products can have on sustainability, health and well-being. Parquet, the Real Wood flooring, is an environmentally friendly material to build your home but also the future! Invest in it! !